Are you making the best of your meetings? Amit is sitting in one of the weekly review meetings with his team mates and boss. He does not understand the point of wasting time in this meeting. There seems to be no specific agenda, no real outcome.. he waits desperately for his phone to ring so that he has a reason to walk out of the meeting and excuse himself for a few moments to check his mail and make important phone calls. Does this setting seem familiar? If we were to do a study of the amount of managerial time wasted in meetings with no specific agenda, we would realise that freeing precious managerial time by conducting crisper and focused meetings would in itself bring in efficiencies which could significantly enhance productivity and profitability. Determine if the meeting is necessary -The fact that you’ve always had a Monday morning meeting does not mean it is essential. 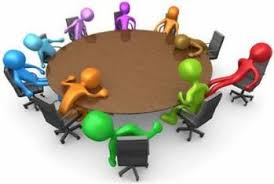 Maybe a fortnightly meeting is all that is required and other meetings can be set up if something urgent comes up. Set your objectives – Prepare an agenda and set objectives for the meeting. Share this information with the other attendees well in advance and invite them to add agenda items in the days or weeks before the meeting. I Provide an approximate time frame for each point on the agenda. Allow only a minute for the minutes – If there are minutes from the last meeting, distribute them in advance. Too many meetings get derailed when the previous meeting’s decisions are recapped for those who did not attend and the discussion is reopened. Stay on track – Start on time, and do not repeat everything for latecomers unless it is absolutely essential. Use a flip chart or white board to write important points. Allow people to opt out – No one should feel imprisoned in a meeting. If you only need Mr X from admin team for one item on the agenda, offer him the option of arriving late and leaving early. Watch the time – Appoint a timekeeper if you will be discussing contentious issues that historically have caused lengthy debates. If a couple of participants engage in a discussion that could be better resolved outside the confines of the meeting, suggest that they take it off-line, discuss it later and report the results by e-mail or at the next meeting. Maintain control – If heated arguments break out, reinforce your role as the meeting leader. Remember that someone needs veto power to cut through debates and bring back order, and that responsibility falls squarely on your shoulders. Engage the participants– If you want to encourage active participation, give participants an opportunity to share their ideas and opinions, within the available time constraints. Brainstorming will not likely be productive in a rush meeting, so only do this if is necessary. When there are a number of issues to discuss and the assembled group is large, consider having breakout sessions. You’ll find the entire exercise goes faster and your meeting is much more productive. Having listed concerns, causes and possible solutions, each group can present their findings for further discussion and strategic planning. Recap -At the close of any meeting, ensure that you briefly repeat the major decisions reached and the next steps planned. Confirm the date and time of the next meeting, if one is necessary. Follow up with a brief written recap and a copy of the action plan, notice of the next meeting and a request for additional agenda items.